So far more than 5,000 cases of dengue are report­ed in Punjab, out of which over 4,400 are from Lahore alone. So far more than 5000 cases of dengue are reported in Punjab, out of which over 4400 are from Lahore alone. The total number of patients suffering from dengue virus has exceeded 5,000 in Punjab, while three more people have died, Express 24/7 reported on Wednesday. Official figures report 11 people have died in the province. However, unconfirmed reports state that the death toll has reached 18. So far more than 5,000 cases of dengue are reported in Punjab, out of which over 4,400 are from Lahore alone. Admin rooms of most hospitals in Lahore are converted into wards to cater to the surging number of patients. Over 4,000 patients were tested for dengue at Lahore’s Jinnah Hospital today, out of which a hundred have been tested positive. Meanwhile, a team of Sri Lankan experts is also expected to arrive in Lahore today to help the authorities combat the menace of dengue. According to the latest statistics provided by the United Nations (UN), as many as 50 million people have become victims of dengue fever in the world and about 20,000 die of dengue virus every year around the globe, PPI reported. Dr Farah Kamran, medical specialist from Daska DHQ Civil Hospital, disclosed UN data while addressing the participants of an anti dengue fever awareness-raising seminar held at Daska city. Kamran revealed that the fears of spreading dengue fever were rising in Asia especially in Pakistan day by day. She said that according to the World Health Organization (WHO), the main causes of spreading dengue fever were the increasing temperatures, heavy rains in some areas, floods and rapidly growing population. While addressing the seminar, Dr Riffat Shafiq, a children specialist, said that the dengue fever affected patients should ensure the maximum use of boiled water. She added that the common use of honey in warm water, fruits like oranges, guava, apple and black seeds and black pepper could also help to prevent the dengue fever, especially in growing children. Dengue outbreak is on the rise in all parts of Punjab including Islamabad where the number of patients has tripled in the Pakistan Institute of Medical Sciences (PIMS), reported Express 24/7 on Wednesday. According to sources, 276 patients are being treated at PIMS in the outpatient ward, while 26 have been admitted to the hospital. In the Poly Clinic hospital, 30 patients were reportedly discharged after treatment while two of them are still under treatment. Four more patients were diagnosed with dengue in Gujjar Khan tehsil of Rawalpindi, raising the number of patients in the city to 18. In Faisalabad, at least 170 people were inflicted with the disease while 44 people were detected with the virus in Sargodha. 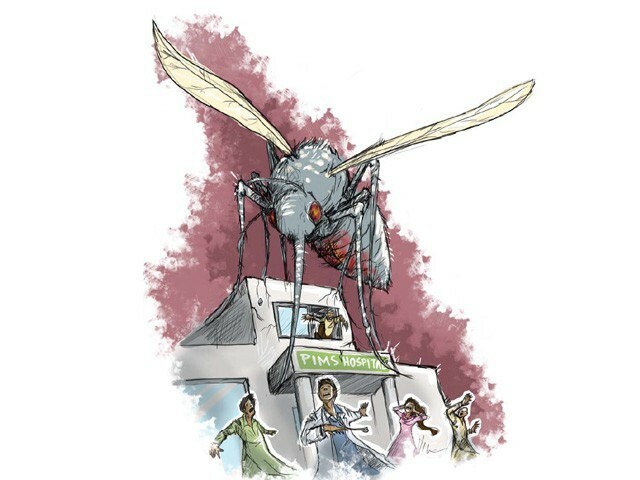 The authorities at various hospitals in Lahore refused to give out the exact number of dengue patients to the media, as the virus keeps on spreading all over Punjab, according to a report by Express 24/7. Sources said that the government hospitals were asked by the Punjab Health Department not to divulge the number of patients admitted in their hospitals. The officials believe that the rising number of patients would cause an undue panic among the people. Express 24/7 contacted the spokespersons of Mayo and General Hospitals to verify the number of patients admitted in their respective hospitals, but the spokespersons refused to give the official numbers. Other hospitals are not taking calls from the media. Meanwhile, private hospitals in Lahore are also not providing free treatment to dengue patients as announced earlier. Punjab Chief Minister Shahbaz Sharif gave out orders for the setting up of 20 dengue diagnostic centers in Lahore. According to a Punjab government spokesperson, Sharif directed the additional chief secretary to establish the laboratories within the next 24 hours. The managements of Rawalpindi Medical College, Holy Family Hospital, Benazir Bhutto Hospital and District Headquarters Hospital have put their staff on red alert to cope with the epidemic. PMDC secretary, Ataullah Siddiqi was diagnosed on Friday. Three Chinese engineers in Lahore also diagnosed. 169 cases of the dengue virus have been reported in Karachi alone. DCO claimed that Muzaffargarh was now a dengue virus-free district and there was no chance of any future outbreak. I am certain the health ministry is well informed on the cure and prevention of dengue fever. Since there is no platform to have a one on one conversation with the ministries and departments responsible for water supply, i am forwarding my questions to the media and i hope someone will answer them. We all know for a fact that that aegypti mosquitoes breed in fresh/still water. 1) Are the water reservoirs being monitored by authorities? 2) Guppy fish introduced into lakes has been known to eat the larvae of these pests thus reducing their number. Has anyone thought of doing so? and give health to the dengue infected people..
A lot awareness about Preventive measures should be spread through all possible mediums. Aerial Spray should be one effective measure to control this epidemic. This is the excellent administration Shahbaz Sharif is providing. India and America has used their six legged soldiers against Pakistan…. Whereas scores of people are dying with the dengue fever outbreak all over Punjab, Chhota Sharif is doing nothing except for delivering fiery speeches. Dengue fever has slit open the myth of Chhota Sharif about his cleanness and fumigation drive in Punjab…. Well, we can think about it in two ways. IF you think religiously then just imagine about Divine Wrath over Punjab just as what God did to Nimrod and people of Mesopotamia.God is doing the same due to lies of Shahbaz Sharif to Punjab. What can we do? Throw him out from government and bring in some sincere leaders (not JI of course; they are worst than Sharifs). Look at Sindh. Since the day Mirza swore falsely on Quran, rains played havoc on Sindh and specially Badin that is feared to be eaten up by sea… Wrath of God on people for electing such loser as their leader… Wrath of God over KPK in the form of Taliban who are killing people in scores.Wrath of God over Karachi for electing those who sympathize with dacoits. God where are we going? Ask divine pardon of your sins! Response Punjab Government is making useless hue and cry over Dengue; the steps on war footing are just a melo-drama. People are well aware of such stereo type responses when things become out of control. Punjab Government never took timely measures to control such disasters. Punjab Government is busy in politicking the situation and waging a war against Government. Mian Nawaz Sharif is issuing political statements and advocating centre, forgetting the miseries of People of Punjab. Apart from the Dengue, still Punjab Government failed to find any clue of Shahbaz Taseer, kidnapped from the heart of Punjab in broad day light. Poor health situation, poor law and order situation, poor educational structure and poor governance. I wonder why Punjab Government does not mind its own business rather than poking its nose in issues of centre. PML-N has badly failed to govern even a single province, how it can run entire country, is there any one to answer this grave question? Pakistan is reeling under pressures of insecurity and militancy of all possible sorts. In the north-west religious extremism is keeping the security apparatus busy while the south is engulfed by the flames of ethnicity-based civil war. Balochistan is beset with local insurgency and in Punjab the dengue mosquito, a formidable foe. And unfortunately all of these issues owe their intensity to decades of neglect and maladministration. PPP is not the solely responsible for all these issues and all the onus lies on the shoulder of a dictator and previous regime. However leaving apart the grave issues, if we take the case of Dengue in Punjab that has spread fear among people and more than one dozen people have lost their life, it is still out of control and that is worst example of governance. No proper fumigation campaign was kicked off by Punjab Government before Dengue out break. Machines are out of order, there is deficiency of medicines and shortage of beds in hospitals. On the other hand Punjab Government is busy on spending money for its publicity. Everyday 5 or 6 ads are published in different newspaper. Mr. CM it is not the time to earn publicity but to take practical measures to control Dengue.